Janice H2O Color: My First Posting! I hope this goes well-my first time out of the gate! 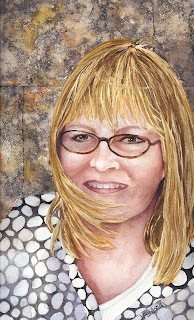 Last semester I took a watercolor class at Mission College and one of our assignments was to paint 2 portraits. I decided to try a self-portrait for the first one. My main focus in creating the painting was to emphasize the contrasting textures. Translating the stone wall to the page was a very experimental process involving the application of countless layers of spattered and smeared masking fluid, interspersed with many washes and splotches of paint, followed by much crossing of fingers and hoping for something decent. The result was far beyond my expectations-it really looks like granite! Congratulations, Janice, on joining the blog world. This painting is amazing! Nice job. If you need help with a few features, I can probably talk you through a few things, though I'm still a novice myself. However, we have to wait until next week -- I'm doing some teaching and attending a conference associated with cycling all week. Yay Janice!! I'm glad you have a blog and I love this painting! The background is really great texture and the painting has a lot of feeling with the blowing hair and all. Thanks for including me in your blog family. This doesn't mean we can't talk often though. Woo-hoo! You are awesome! These textures are so realistic! Janice- This is fantastic! The granite really does look real. But the part I like is how you use texture and pattern throughout the painting- the shirt, the hair, the wall. Very professional looking.